What is confetti? Why do we throw it over the married couple and why does the bride throw flowers over her shoulder? Why do we tie shoes to the back of the wedding carriage and why do we have a three-tiered wedding cake? Confetti comes from Italy, and hence is a Roman tradition. Confetti is the Italian word for ‘sweets’ that they throw over the couple as they emerge from the Church. This is like the way we use paper confetti nowadays. Before the use of paper confetti, the married couple were showered with flowers, petals, rice or grains. These symbolised prosperity and fertility. During the wedding reception the bride throws her bouquet back over her shoulder where the unmarried female guests group together. Tradition holds that the one who catches the bouquet will be the next one of those present to marry. This dates back to Tudor times where the bride would throw one of her shoes over her shoulder. This brings us to the importance of shoes – which traditionally brought good luck. The popular custom that is still upheld today involves tying shoes to the back of the newlywed’s car. Again, this evolved from Tudor times where guests would throw shoes at the couple as it was considered lucky if they or their carriage were hit! Cakes have been associated with weddings throughout history. The Romans shared a cake during the wedding ceremony itself. Cutting the wedding cake is now part of the ritual celebrations at the reception. The couple make the first cut of the cake together to symbolise their shared future. Traditional British wedding cakes contain fruit and nuts as they symbolise fertility. In the past the custom was to throw many small cakes over the bride in a similar way in which we throw confetti today. A modification of this custom was to crumble the cake over the brides head! Another old English custom was to place a ring inside the wedding cake. The guest who found the ring in their piece of cake would be ensured happiness for the next year. 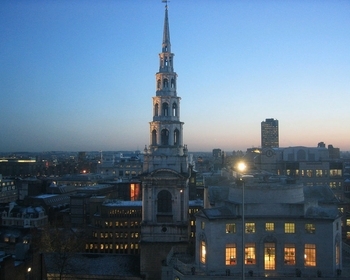 The shape of the modern three-tiered cake is believed to have been inspired by the spire of Saint Bride's Church in London. While the rest of the cake is eaten at the reception, the top tier is often kept by couples for the christening of their first child. Check the next article for history of people involved in the wedding ceremony – why do we have bridesmaids and what is the importance of the best man?